In The New York Times on Sunday, April 10, 2011, Jonathan Mahler has an interesting article about the “deadlock” that has settled into our debate about school reform in America today. Either we are for teachers’ unions or we are not; either we favor charters schools or we don’t; either we believe in increased testing or not — and “neither side seems capable of listening to the other.” We are paralyzed against any effective action. I find the article rather cynical. In this “polarized environment,” the author implies, there seems to be no way forward. I don’t find that acceptable. I guess I don’t believe that paralysis on such a huge national issue is an option. On Friday of this past week, Seattle Pacific University hosted some 1,300 community leaders for our annual Downtown Business Breakfast. Our topic was the crisis in our schools. What exactly is the crisis? Where are we headed? What are the solutions that just may be emerging? Our keynote speaker was Tavis Smiley, who did a fabulous job of framing the discussion. Our governor, Christine Gregoire, also shared her vision for the future of our schools. We had several heroes from our schools, many of them SPU alums. We had many of our SPU faculty represented, a group that is wrestling with the issue in very helpful ways. I had the privilege of speaking to this audience as well, and I want to offer a part of my speech to my blog audience. I care about this issue a great deal. I think it may be one of the most important social issues of our time, and I have been wrestling with where we go from here. And so here are some excerpts from my speech. I would love to know what you think. Excerpts from A Nation At Risk: Why We Must Build Better Schools, delivered at the Downtown Business Breakfast for Seattle Pacific University, April 8, 2011. Remember, this is 1983, but the theme is something we’ve grown accustomed to. All of this is an indictment that ought to ring through this room this morning, calling us all to action. And we ask: Can this be America? He pulled back for a few seconds to let that soak in. 300 million children: Of course the numbers are staggering, but couple that with a will and a plan and a determination, and our challenge in America becomes clear and daunting. We have all been reading these kinds of statistics over the last decade and more, and we are puzzled and dismayed. But statistics never tell the whole story. The crisis in our schools starts with each kid who does not learn to read, each kid that drops out of school, each kid that cannot go to college, squandering the precious potential of one human being. The crisis starts with the broken hearts of parents who see their kids lose in the school lotteries. The crisis continues when kids grow up without enough education to get a job, thereby damaging a life, a family, a neighborhood, and the economic wellbeing of our country. The crisis continues with every young person who tragically ends up in prison. The crisis ends when our companies have jobs to offer but not enough of our own young people qualified to fill them. America has never been a defeatist nation, and yet somehow on this issue we seem to be wringing our hands. We seem to be kicking the can down the road. We have let ourselves believe the problem is not fixable. We have accepted the mythology that kids from underprivileged and tough neighborhoods can’t succeed, and so we have virtually abandoned them. The first principle that guides our work at Seattle Pacific University is this: God wants all of his children to flourish. This is a theological, philosophical, and moral driver for us. Every child deserves the chance to read and write. Every child deserves the opportunity to learn and grow and thrive. Each child is precious in God’s eyes. There is no way to skirt this deep moral commitment for our nation. A second driving principle is this: Education is the path to human flourishing. From the Greeks and on through the whole of Judeo-Christian teaching, education is the path to growth, maturity, balance, the making of good choices. It is the path out of poverty, the path to both productive and meaningful lives. This too must be a bed-rock conviction for our nation moving forward. Third, we must recognize that education begins and ends with that profound encounter that happens between a teacher and a student. We know there is a magic moment in the learning process, where a great teacher, with passion about a subject matter, connects, quite profoundly, with a student. We have the tools to assess those teachers who are making this happen. This is where our focus must be moving forward. Fourth, solving our nation’s crisis in the schools will require leaders to step forward, leaders from our schools, leaders from higher education, from government, from business. We’ve got to stop slinging the mud and spreading the blame. We’ve got to reduce the territorial battles between self-serving organizations — all of that puts the focus on the adults and not on the kids. The focus here is on the children of our nation. That’s where we start. Clearly there are wonderful success stories in our midst, and we celebrate those stories this morning. We need to learn from those stories as we move forward. But just as clearly we have a job to do. I pledge to you this morning that Seattle Pacific University will be at this table of change and renewal and reform. I’m not sure where we are going with all of this, but I am convinced this is one of the most important challenges of our day. In the end, Arendt has it right: We’ve got to “decide whether we love our children enough” to teach each one of them to read and write. We’ve got to decide whether we love them enough to give each one of them a chance to flourish. And if we don’t, the warning is clear: Our nation is indeed at risk. I think our school systems have been handicapped in ways beyond the system. Teachers are doing their best but somehow we stopped kids from having that inquiring and reasoning mind. Learning is about asking questions and looking to break things down to the fundamental “why”. We have an entire generation of adults that watch our governments do crazy things with money and nobody is asking what the heck is going on. Also with parents working it takes great commitment by them to keep that foundation of homework and school priorities. I love this, the question is do we love our children enough? I recently spoke to a group of educators and sadly most of the conversation is about them versus the students. My mother is a 20 year school teacher. She was in a union, but in many ways I think they have hurt more than they have helped the children themselves. Thank you for this. Keep doing God’s work. P.S. Tavis is a great speaker. I love Fail Up. One of the repeated stories in school success that have come to my mind have been when volunteers joined teachers in their efforts to reinforce reading skills( or other basic skills). Childrens school performance goes up when they meet an adult who pays them attention once a week for 30 min. – 60 min. and practices the ABC or whatever basic skills are needed. Not only does it support the teacher in his/her effort, it affirms the child of its personal value and ability to succeed. A school project of this kind in Sunriver, OR involved the retirement folks of the area …. the program is a success all around. What would happen if church people,people in retirement / retirement communities, homeschooling parents etc. would adopt schools and do just that. It might just be a drop in the bucket, but every drop means a child gets that drop, before it drops out. Obviously this does not address the bigger question of policies which have to be addressed, but it also shows we can not neglect/ disregard the impact of the individual in the process. I have been teaching for 35 years. I hold a doctorate in education. Often I feel overwhelmed by the complexity of education problems and processes. When I get to the point where my head is spinning I have to pray for help in deciding “what is MY role in the solution?” I am led to a new challenge with my heart. Currently two Samali families want my help for tutoring a total of 5 children. Do I do it? Do I include them in my already busy schedule? I know I must and yet, it’s the time. Facing these issues on a personal level keeps me rededicating myself to this calling. Daily I open my work with love and prayer. I feel as though I am a tiny drop in the mix, challenged and imperfect. Again it’s overwhelming. I try not to challenge the direction I feel I am being given. However, I never feel it is enough. This is an issue that I have devoted my life to for the past 18 years. If I may offer a just a few lessons that I have learned in my journey. •	Education is the transmission of a body of knowledge and a shared culture from one generation to the next. In the last 50 years, forces in our society have resulted in a fractured culture. The fragments left over from these competing worldviews are still at war with one another. One of the principle battlegrounds has become the schoolhouse. The battle over whose culture survives in the classroom has managed to cannibalize the academics. The three R’s are not only allotted less time in the school day, but have actually become casualties in the war themselves. Phonics lost out to whole language, fuzzy math superseded rigorous mathematics, etc. •	Decisions about education are best made closest to the child. I believe this is why homeschooling is so successful. The next step would be the local school and district. Education “reforms” have sent this control the wrong way. Local districts have very little leeway in their decision-making. States, also, have ceded control to the federal government by taking money. The more the federal government has involved itself in education, the worse have been the results for the children. •	The new focus on getting rid of “bad” teachers is a red herring. Who gets to decide what constitutes a “bad” teacher? It turns out that it is the same folks who have been promoting all the other “reforms”. What is a “bad” teacher to them but someone on the other side of the culture wars? You or I might deem that to be a “good” teacher. The real problem is bad curricula. No teacher can get good results with bad curricula. Societal problems are inevitably reflected in the schools. Solving these problems will go a long way towards fixing education. But these are largely problems of the heart. And we know there is only One who can deal with our hearts. Thank you for taking the time (on a Saturday) to engage our minds. I would like to comment that as we look at how to improve our education in America, we look at the beginnings of education of a child and that is in the home. We need to focus more on the education of parents in every type of home so they can engage and support the education of their children in the classroom. The engagement of parents makes a difference throughout a person’s education. It would be interesting to know the level of parent engagement in some of the other countries where education is moving ahead. My other comment is in regard to our thinking that every child needs to go to college/university. I believe every child has a right to education beyond high school; however we need to advance more opportunities, not just university. Perhaps we need a combination of technical/trade education with college. Wouldn’t it be great if every college graduate also had a skill that would allow them to be employed while they study or soon after graduation. Again, thank you for this opportunity. graduating from your university. She went on to continue to explore life and pursue more education. Her views seem to be dead on with yours. Marni is currently in the trenches teaching 6th grade students in a small school in Umatilla Florida. She has many underpriveledged students. She finds the breakdown of family structure and knowledge a hudge hinderance to the advancement and motivation of her students. The problem has been going on so long, the mind set needs to refocus on the children. Not the politics of the administration. The breakdown of focus and the race for money has blurred and damaged the purpose of a good education to the extream. With her fantastic education Marni could advance to administation but she feels politics are not a healthy alternative to reaching her students who deserve a fighting chance. Thank you and your university staff for providing her with the fantastic college education foundation to continue on and carry on the burden to make a difference in education and the world of music, math and the arts. You are doing a fantastic job please keep up the good work and your focus on excellent education for all. Upon reading your article this morning I was impressed at the enormity of the task you’ve identified. Shortly after reading your blog I listened to a lecture on TED.com, about apathy and how we are influenced to not get involved. Here’s the link below. As we all know, failure to identify ‘the problem’ is the first problem. Failure to respond is the second ‘problem’. This lecture points to and identifies obstructions that block solution-based, get-involved thinking. You’re right, big problems can be solved, but someone must start. Thank you for sharing your words delivered to the gathering earlier this month. And thank you for making it so clear that Seattle Pacific University continues to be at the forefront of leadership in seeking solutions to our nation’s (and state’s) education challenges – but even more, by being a model, a light in the darkness, that points to the most important aspects of a caring, holistic and character-based education for ALL our children; an education that will help them not only find employment, but, more importantly, will provide them with the tools to make carefully considered and morally based decisions along the way. I appreciated waking up to this thought-provoking email/blog this morning. I’ve been in education for many years and have seen the decline of student achievement, the polarized environment, and the “eroding rising tide of mediocrity” that is mentioned in your article. However, today I am encouraged in the Lord and encouraged by The Work at our elementary school. 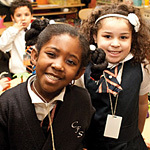 Even though we are a public school, there are many colleagues on our campus who are standing in the gap and praying daily for the success of our students on all levels: academic achievement, social awareness and competency, having goal-oriented mindsets, and our students recognizing that they can be successful and make a difference in our world. We face tremendous challenges in our inner-city school with over 90% of our students receiving free and reduced lunch, 50% English Language Learners, and being a program improvement school. In the past four years, though, we have made great strides with over a 70 point increase in our API scores. The Work has been intensive. We’ve had to take a hard look at our own instructional practices, set higher standards of achievement, be open to observations and collaborate extensively on standards-based instruction and lesson studies. It hasn’t always been comfortable but we feel the transparency and collaboration is working for us. What it has taken is what you mentioned in your blog today: a strong, visionary leader, a passion by the teaching staff for improvement, and a desire by all to see our students flourish. Praise the Lord for His grace and mercy towards us. Once again, thank you for sharing your speech online this morning. As Christians, we must pray for transformation and healing that only comes from our God. In regards to your principles on which to move forward, I would like to give my 2-cents worth of wisdom based on 60yrs of living and the raising of 4 children, 3 of which are in college and 1 of them is currently attending SPU. I would agree that God does want all of His children to flourish but not primarily through the hands of educators. The primary role is the parents. However, for the vast majority of parents in this country, they have abdicated this responsibility as a result of pleasure, the pressures to feed and house their children, the pressures of our society and the pressures of our government. Unfortunately, there is no forseable hope for parents in our current situation. But it doesn’t mean all is lost. In some way I would also hope that the educators today in universities and colleges, guided by Judeo-Christian values, would also see a responsibility to the Creator of educating men and women and wrap such education in the blanket of a devotion to honor GOD in all that they do. To seek with passion ways of deepening their faith and passing on such passion to their children. To be supremely educated is admirable but not to build that on a solid moral/Godly base is what God deplores. The goal of education is to have students who will become fathers and mothers to pass on, not just those things they were taught, but to primarily pass on the responsibility of honoring GOD in their words, in their actions, to their neighbors and for their country. There was a time that this model PREVAILED in this country – but no more. In regards to #2 – Throughout history, those nations who honored GOD did flourish and the same goes for our children. I believe and have seen in my own family, that when an individual strives to honor HIM, that they do flourish in spirit and in themselves. It means that they become a positive influence on their peirs and in the world around them. The current education system does not and cannot guarantee that an educated person will flourish – no matter how much knowledge one jams into a computer, it can do nothing if it is not turned on. From my perspective a person who loves GOD and strives to honor HIM is turned on. #3 That is true and I continually pray that my children are under teachers who will challenge them not only in their educational process but also in their commitment to honor their Creator. I have consistantly told my children to challenge their teachers and to be a witness of their love for GOD. I hope and pray that your university strives to not only find teachers who have this yearning to impact their students to mature and to understand their role as men and women, as future husbands and wives as well as future fathers and mothers. Such instructors need to encourage them to look at their own responsibility to GOD and to use what they have been taught to make a better life, marriage, family, city, state, country and world so as to honor HIM. #4 Right now our church is going thru a rather tough time. I believe that it has been a result of pour leadership and of selfishness and pride. There are many factors that produce and make up a leader. But I would say there must be a vision, another is a burning of the heart and the third is a broken heart (not in that order). The Bible tells us that to be a leader one must be the servant. This is a complexity for many of us and it is hard to achieve for most. I have often found that education and position all too often produces very prideful individuals (no broken hearts). Such individuals are consistantly blind to the obvious and they make things worse by their idealism. I would hope that SPU will produce leaders and these ‘leaders’ will have a vision, a burning heart and a broken heart. I can tell that you have a vision, a burning heart and I sense a broken heart. I will pray that GOD will give you not only wisdom but men and women who will help you establish what HE wants in SPU. I will pray that the burning in your heart will not be quenched by those who settle for the ‘can’t we all just get along’. Finally I will pray that you have a broken heart in your relationship with GOD. That HE will use that humility and frailty in a way that will not only bless SPU but will lead SPU on a road that honors HIM. Your speech brought tears to my eyes. Having worked in schools with students from many different backgrounds and races, I have experienced first hand that it is usually the lack of enough parental love or parental support that holds students back from excelling in school, not economic poverty. Children who derive from chaotic, violent, or domestically unstable homes, whether rich or poor, are at a distinct disadvantage when they enter school. Children need to be cuddled and read to by their parents, they need to feel loved and secure in their home. They need to come to school well fed, and with a sense of emotional well being. Then, they can focus and apply themselves to the task of exploring and learning. Teachers can have a significant impact on young developing children by providing them with a safe, nurturing, and stimulating environment in which to learn, but they are only part of the support system that every child needs in order to succeed in school. Students are capable of meeting our expectations and going beyond them but only when they are encouraged to do so by significant others in their lives. As parents, teachers, counselors, business leaders, politicians, and religious leaders, we are blessed with the opportunity to be that significant other to many, many children in this world, not just our own. Yes, leadership is key, and what we must hold most high is that we love our kids, all of them, to help them learn to fully respect and love themselves and others, with the hope that they know themselves, others and the world they live in well enough to extend themselves beyond mediocrity to love one another. This does take what educators offer and usually practice regardless of their faith orientation. It is so amazing that public education teachers and administration are able to endure these times with many young people still with the desire to pursue this career – or should it be calling. The joy of learning is part of being and belonging to the Creator and the Christ within us enables redemption from ignorance. I respect the effort that SPU has placed on imparting values and knowledge to those fortunate enough to attend. Somewhere along the way our nation has lost sight of the value of ‘knowledge’ and substituted a belief that ‘education’ is essential. In today’s world, Bill Gates, Steve Jobs, Larry Ellison and Michael Dell would be unable to get an interview with any major technology firm because they don’t have a college degree. Likewise they could not teach a basic business course or computer science course in most schools because they don’t possess a Teaching Certificate. Meanwhile, in 2001, the National Center for Education Statistics reported the average SAT score for intended education majors to be 481 math and 483 verbal. Only those interested in vocational school, home economics and public affairs scored lower. Somehow the ‘process’ of educating has too often become the objective. Our belief that everyone deserves a college degree has, in my opinion, caused our schools to insist that all those who don’t voluntarily drop out, graduate regardless of demonstrating knowledge of basic subjects. Evidence exists that our focus on the underprivileged has mutated to a focus on the under motivated while resources are unavailable to bring out the best in the exceptional student. I hope that SPU will continue to focus on “…graduating people of competence and character…”. If you continue to be successful in that your graduates will be able to change the world. One change to consider is to have ten years of work experience as a prerequisite to becoming a teacher. People who would be willing to give up a successful ten year career are people who care about students and who value education. These are the people who would promote your excellent list of foundational principles. These would be the people who would love children enough. Do we really have those tools? Can we actually assess the bond/relationship/connection that occurs between teacher and student? If we can, what does that look like? Teacher evaluations? District/State student assessments? I would be hard-pressed to see how test scores could do justice to what actually happens in the classroom. Can assessment of human-to-human contact ever be objective? I most certainly agree that the teacher/student relationship must be our focus moving forward. My hope for us, however, is to remember that which we are “dealing” with: human beings. Not numbers, products, or services that can be neatly categorized and documented. I think this is what sets the education field apart from much of the business world. We help shape lives and that will always be “messy” as long as we humans are involved. The most educationally impoverished segment of our population (and those most likely to be in prison at some time) may at first glance seem to be a product of racism. I believe that a closer look will tell us that the most important factor is growing up fatherless, regardless of race. Fatherless kids often grow to beget fatherless kids themselves. I believe that somehow we must teach boys and young men how to be good fathers. Surely there are people with the intellect and passion to design and implement strategies to accomplish this. You make several good points. I would add leaders from faith organizations to your fourth point that “solving our nation’s crisis in the schools will require leaders to step forward, leaders from our schools, leaders from higher education, from government, from business.” I began my doctoral studies two years ago in hopes of engaging faith organizations in public education. People of faith should be about the work of educational equity–making a difference for ALL children in ALL communities. Leaders from varied faith walks should be able to collectively pursue the best educational opportunities for all our children. As a public school teacher I react to comments like yours with mixed feelings. While it is remarkable for men of your position and influence to be interested in public education, I wonder if you could address your thoughts to a more specific audience. Who, in your opinion, is failing to “love our children enough”? I would hope that you would avoid faulting anyone who spends time with these children in the classroom. I have to disagree with the idea that no one in the education debate is listening to the other side. As a teacher, I feel like I am a member of a profession that is not being listened to…but I hear the other side loud and clear. It isn’t that I’m not listening, it’s that what the other side is saying is not valid. Very frequently, in fact, what the other side is saying is not only wrong, it is utter foolishness. It is impossible to have a dialogue with bombastic, political soundbites. The soundbites are always very clever, but they add nothing that will actually help students. Only in education do we assume that non-practitioners have some sort of special insight. When your teeth are broken, you ask advice from a dentist. When your car is broken, you ask advice from a mechanic. But when your school is broken, it somehow seems logical to ask advice from the least informed person present. Very often, this means a politician with short-term political goals or a member of an advocacy group with a very narrow, selfish agenda. Not all opinions about education are equal. Instead of dismissing the opinions of the professionals who actually know the issues, it would seem logical to count the opinions of teachers as the most profound and important. But that isn’t what we do. Instead, we commonly base our national education policy on what non-educators think might work in schools that don’t exist, in an America that never was. This is as illogical as asking nannies or daycare workers for advice about mechanical engineering. Of course, you’d ask a mechanical engineer about mechanical engineering…but somehow a teacher’s voice is the least important when it comes to education. Instead, we have to act like an anecdote about how 300 million Chinese kids are somehow getting ahead of us is actually a real commentary on education in America. As a teacher, I cannot fix society’s woes. I didn’t raise my students from infancy. I can’t make their parents discipline them and send them to school every day. I cannot fix the job market. I cannot give my students new families and new neighborhoods where poverty and poverty culture will not reach them. I did not cause my special education students to have birth defects and disabilities. I cannot stop their parents from abusing alcohol and drugs, or re-selling their kids’ prescription Ritalin for beer money. Until there is a fundamental shift away from the blame teachers first mentality that drives so-called education reform, real progress is unlikely. When someone else is ready to listen, I’ll be here. I’ll be trying to adjust to annual pay cuts while I spend my own money on curriculum and classroom supplies. I’ll be waiting for you to listen while I’m picking myself back up from all the insults, slights and foolish comments about teachers and teachers’ unions. I’ll still be here trying to do my best for your kids while you tell me how selfish, stubborn and incompetent I am. When will you be ready to listen? I appreciate your words and agree that education is the key for sucess in the future as it relates to United States’ position in the world. The next question is how we approach this issue and what is the solution or solutions. What is ultimately boils down to is money. Are the leaders of America willing to pay for what is takes to make a change of this magnitude? As of this morning the answer is a resounding no, Politicians are more concerned about getting re-elected and maintaining their lifestyle than they are with the well being of education or in my opinion the future of this country. I suggest implementing a 20% pay cut for all politicians and applying those funds directly to Education, that would be a good start but is something that will never happen. What this tells me is that people are not serious and ultimately brings me back to your speech. While it was very good it still leaves me with the same question. What is your solution? What action is Seattle Pacific taking to attack this problem? … Many words, no tangible solutions and no action plan. It is the same with the leaders of this country. I agree with Jae Webb. Re: President Eaton’s #3 – The bond between a great teacher and student is surely motivating for some, but for all the phenomenal teachers, we still have a massive educational crisis. What we are truly missing in this nation are parents! They are the ones who are completely absent in some cases, and only a change beginning in the home will lead to a real change in the future of our once great nation. I have taught in private school and my sister has taught oversees. The difference between both of these & local public education was the involvement of the parents and the pressure they applied to their own children to succeed. I will be homeschooling my own children starting this fall. Jae Webb makes the most important point there is. Fix the family, and you fix education. The second most important point, in my opinion, is that we need to radically and totally de-regulate the educational system which will introduce competition into the educational system. While there are many private and charter schools throughout the nation, they are still in the minority. The public school system is a monopoly, and monopolies have no incentive to change and get better. Great teachers should get paid more. Poor teachers should get fired. Parents and children should have unlimited school choice. Good schools will flourish. Poor schools will go out of business, making the way for better schools to expand or new schools with a vision to begin. Yes, this is a radical thought, but it’s not impossible. But none of this improvement will happen unless the parents take the initiative to teach their kids: they are still the most influential adults in a child’s life. If the parents (or parent or legal guardian) won’t teach the child and set an example by learning themselves (instead of sitting on their butts with a can in each hand watching the tube) the teachers have an impossible job. This post reminded me of a recent NPR segment about gang members in rural Washington, where gang activity is increasing. The reporter asked one teen gang member why he wanted to be in a gang and not graduate from high school, then college, and then have a career. “That’s boring,” the teen replied. I didn’t believe that teen for a second. I think he was more afraid than bored — afraid to be considered “stupid” and failing. Sigh. I couldn’t agree with you more wholeheartedly. I would even more radically extend your call for love of our children from educational reform to social reform. I think there is a problem with our schools, but one that stems not intrinsically from the education system. The system always has room for improvement but more than a system wide overhaul I think the components of the system that are broken (perhaps not the best word) are the same broken components in our society. Us. I think the education reform begins in the home. We have somehow turned latchkey kids from the exception to the rule. The support that our children are not getting in their homes is growingly and painfully evident in school performance and behavior. I’m not responding to harp on the parents of our nation, not yet being one myself, but on our society that holds parenting in relatively low esteem compared to careers and fiscal pursuits. We’ve been guilty of this at increasing rate for some time. Reform begins with parents, uncles and aunts, grandparents, and other family investing less in video game and candy addictions that win them favor and more in developmental and educational pursuits. I think this should always be our aim and our goal. Let’s work now to leave them a better world and instill in them that principle for their children as well. Thank you for words. I appreciate this blog post, as well as your others. There are two elements in this piece that I find remarkable. First, the quote from Hannah Arendt from 1955: ““Education . . . is where we decide whether we love our children enough not to expel them from our world and leave them to their own devices…Our nation will falter and fail if we strike from [our children’s] hands their chance of undertaking something new, something unforeseen by us. We must prepare them in advance for the task of renewing a common world.” This is so true…too often do we expel underachieving children and youth from the world (or even our schools) and then expect them to grow up fine, effectively on their own. This is a dangerous state of affairs and one that we need to reverse…for the betterment of our children and the future of our society and our world. Second, I appreciate and admire your pledge, that “Seattle Pacific University will be at this table of change and renewal and reform.” The university is blessed and fortunate to have a leader of your character and passion for educating the whole student.